I often struggle with the question: Which is the more dangerous Siren: the goddess of sailing, or her sister, the femme fatale of boat building? It's a false choice, of course. Without the sailing, there'd be no need for building. And without the building... well, the sailing would soon come to an abrupt and watery end. Alas, there's a third Siren, not mentioned by Homer, but well known to later poets such as Apollonius and Hesiod. Some say her name was Thlxiepeia, others say Agalophonos. To many a poor woodworker, she's simply known as the third temptation: the beautiful, alluring goddess of tool making. My motivations were not so lofty. 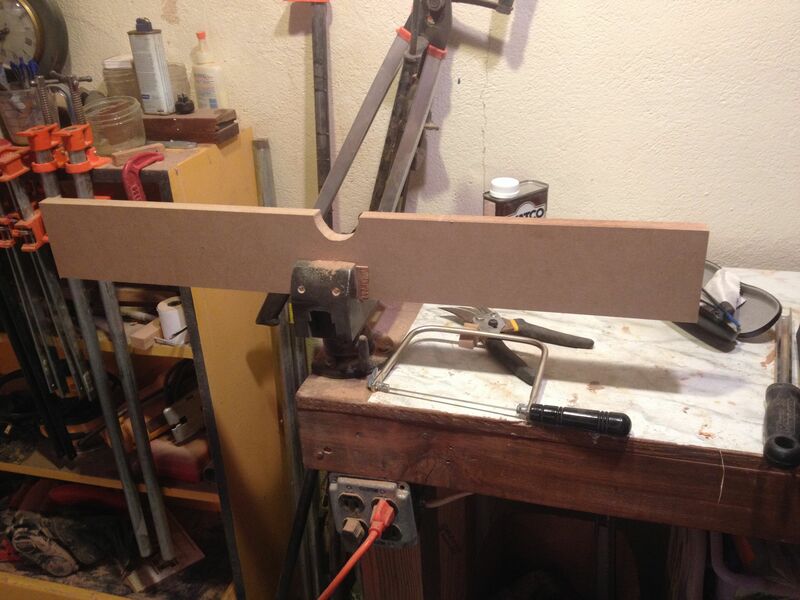 Not to put too fine a point on it, I needed a router table, and couldn't afford to go out and buy one. No, that's not quite true... I couldn't bring myself to go out and buy one, when it would be so easy to build one. I did allow myself ten dollars to buy a quarter sheet of MDF. This was just enough, I thought, to build a good size table. I ripped it into two pieces for the base and the fence, and added a piece of pine for the bottom of the fence. 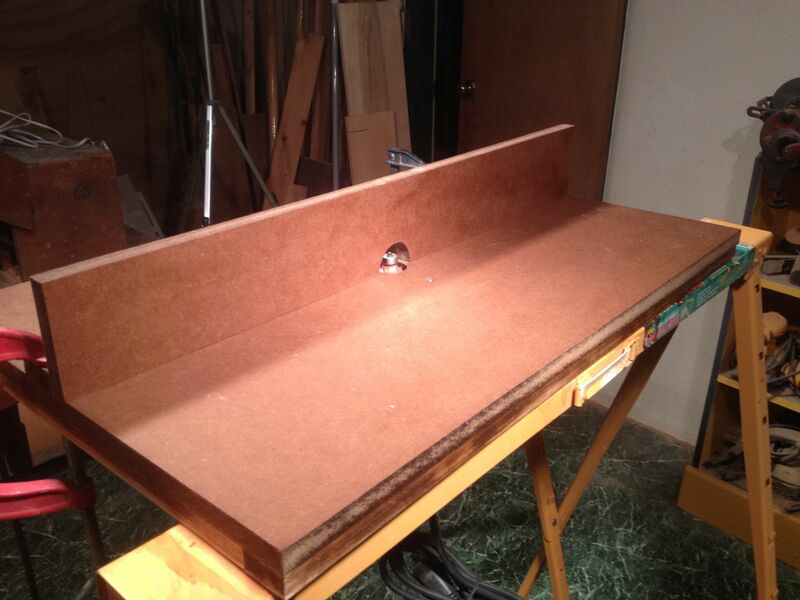 To make sure the 3/4" MDF stayed flat, I reinforced the back with some scrap 1x2 pine, glued and screwed to the bottom. I spaced the frame members to leave plenty of room around the router. 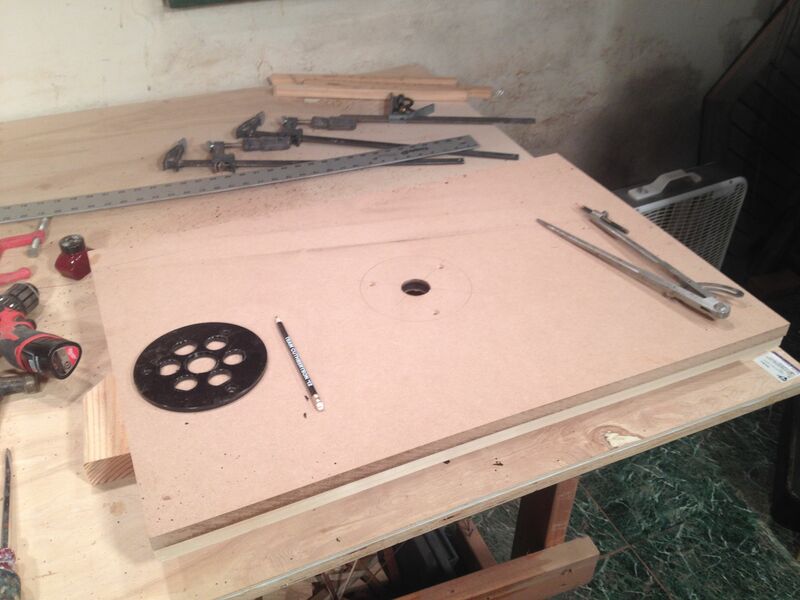 To make the hole for the bits, and for mounting the router, I used the sub-base as a template. The only tricky bit was cutting the hole right in the center. I counter-sunk the mounting holes so the flat-head mounting screws would be just flush with the surface. I used a coping saw to cut two half-holes in the fence and fence base. MDF is dead easy to work with. You might be wondering about a base for the table. Many woodworkers spend hundreds of dollars building a complicated cabinet, with dust collection, draws for bits, retractable power cord, recessed switches, etc., etc. I don't have room in my shop for another large, stationary power tool. 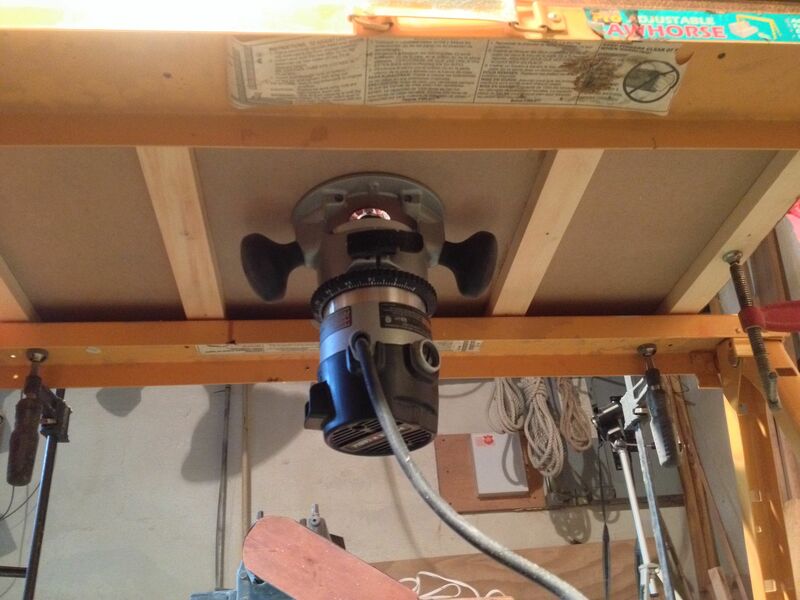 Furthermore, I don't expect to use a router table every day. I want to be able to set it up, use it, and then break it down and store it out of the way. Thus my fancy base will be... adjustable saw horses! I adjusted the horses to their maximum height before clamping the table to them. 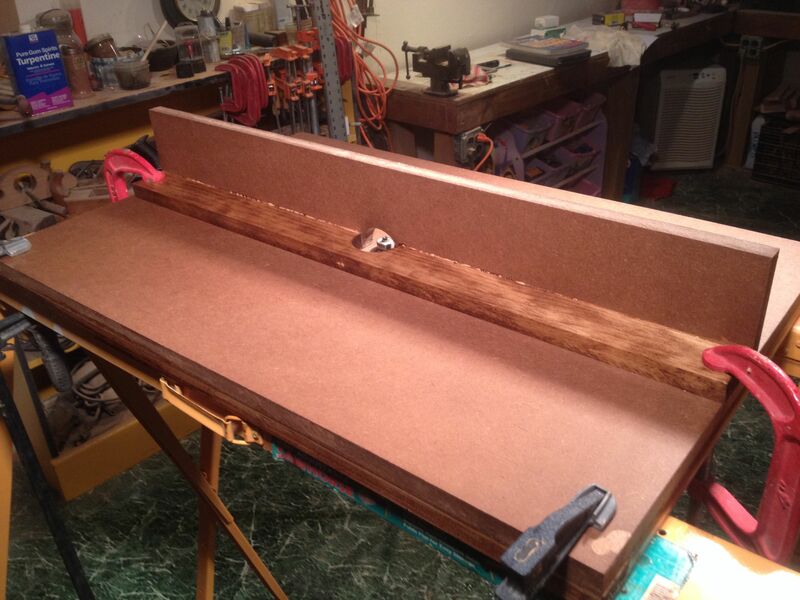 This put the surface of the table at about 41 inches -- just about perfect for routing. Notice how easy access is to the router. No problems here adjusting the router height, or turning it on or off. After gluing the fence together, using a square to make sure the fence was 90 degrees to the table, I simply clamped the fence to the table. Nothing quicker or easier to adjust. 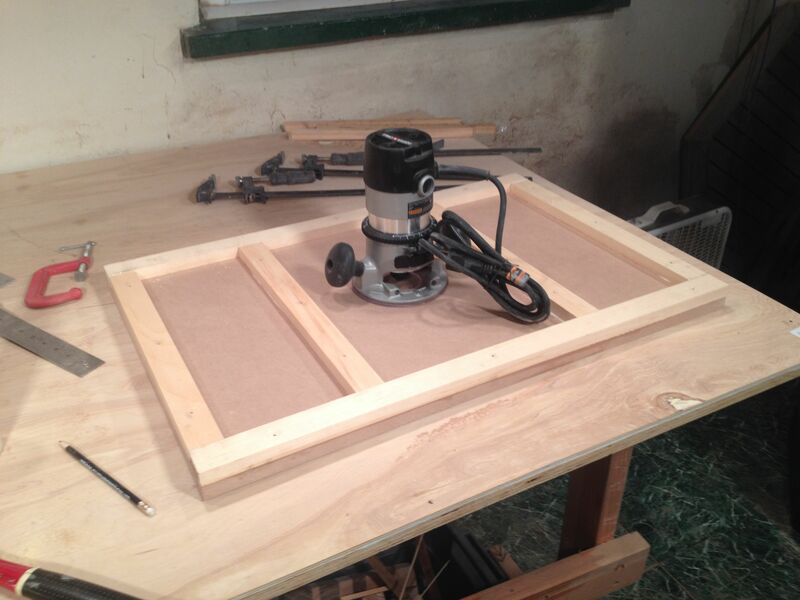 Note how the frame on the bottom provides a strong place to clamp to. 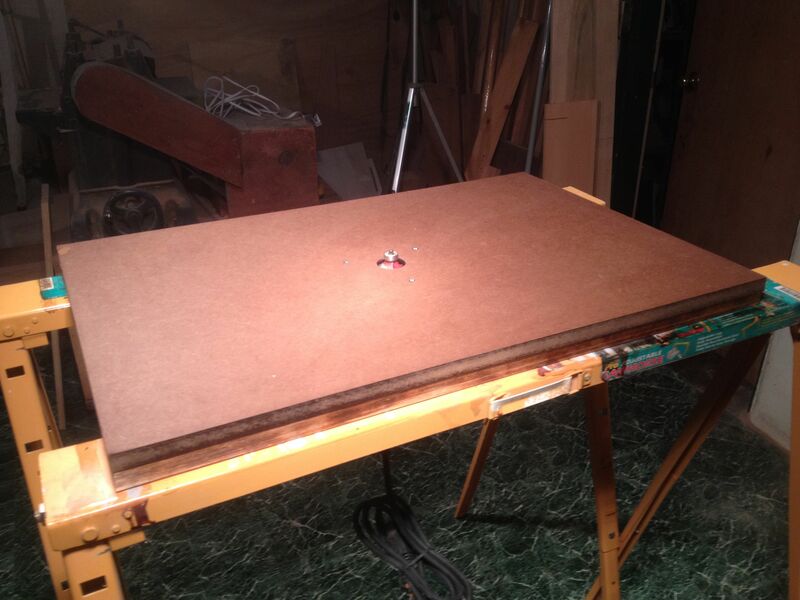 I finished the table with a couple coats of flat varnish: just enough to harden the surface of the MDF. I'm not sure this was strictly necessary, but I like to think it gives it a bit of protection. 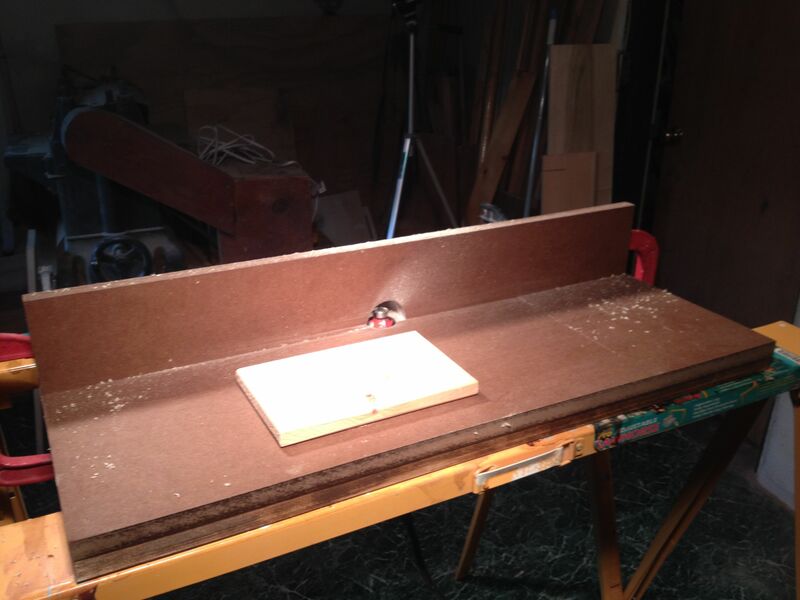 After a pleasant afternoon's work, my simple router table was ready for a test. I installed my 1/4" round-over bit, pulled a piece of wood out of my scrap bin, turned on the router, and crossed my fingers. Then, I uncrossed them, because it's awkward and probably dangerous to use a router with crossed fingers, but you get what I mean. First test with piece of scrap wood... perfect! If I ever need anything as exotic as a split fence, I could easily build one and swap this fixed fence out, but I don't plan on using my medium size router as a jointer, or anything like that. I think this will do me just fine for when I need to round over a small piece of wood, or... well, who knows?! I'm just starting to learn this interesting tool. 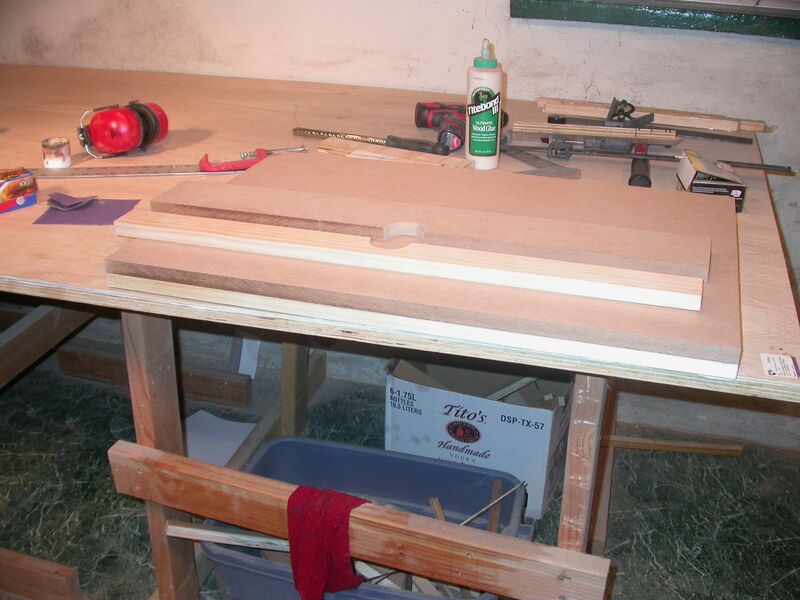 And speaking of rounding over small pieces of wood... That's exactly why I built this table in the first place. More on that, next time. Good to see that the fence is held on with G cramps - they're much less prone to slipping under the vibration than the quick release clamps holding the table to the saw horses. H'mmm. I'll have to remember that. Thanks. That's sounds great. I wish I had room for a permanent table. Nice job, I made a similar table years ago but with permanent legs and it does take up too much room so I think I will go to the saw horse idea as well. Yes, those adjustable saw horses are pretty handy.